My kitchen is small but efficient. I’ve pulled off dinner parties for 12 and a surprisingly rocking baby shower for 30. But there’s no way a whole pig is going into my Easy Bake-esque Ikea oven. Sometimes you have to leave the cooking to professionals. 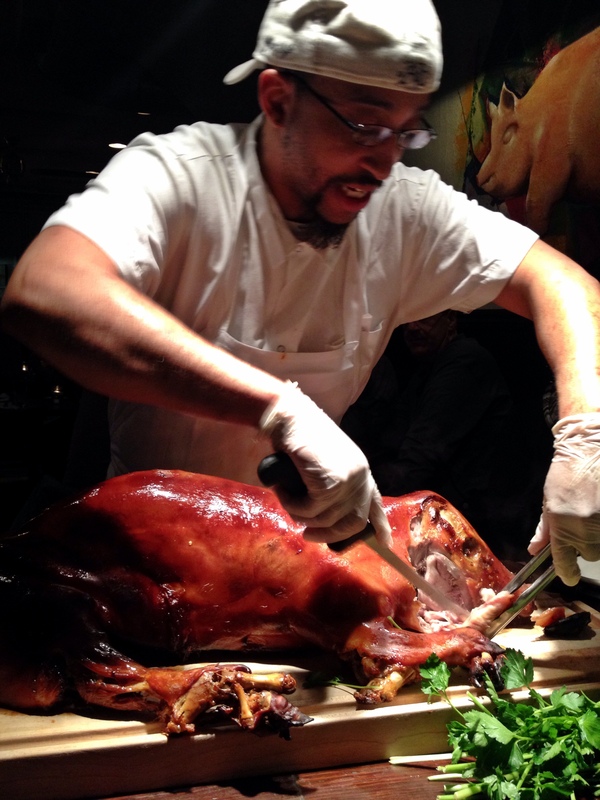 Last Sunday an intrepid group of friends risked life and limb in the name of pork. With snow and ice coating the ground and another storm on the way, we boarded a northbound train along the Hudson. By the time we made it out of the tunnels, the flakes were coming down hard. We disembarked at Dobbs Ferry into a glittery wonderland and hiked up a steep hill. As we rounded the corner, we caught sight of yellow light spilling out of the lone sign of life. It was The Cookery and we were there for their Pig Dinner. We warmed up with a round of cocktails before tucking into some delightful swine and wine. The first course was a sunny side up egg atop some luscious braised kale, which was paired with a dry Gewurtzraminer that did a nice job of cutting through the fattiness. The first course was a hit, despite the fact that some in our party were surprised that it was not fried egg and tail. As they cleared our plates, the wait staff offered sobering instructions. When the lights flickered, we were to clear the way. A few minutes later, the lights flickered and our pig emerged on the largest cutting board I have ever seen. They placed the animal in the center of the table, where the chef made short work of breaking it down into edible parts. The pig came with a red wine that escapes me at the moment and some stellar seasonal vegetable dishes. But all eyes were on the succulent meat and the skin, which has taken on a candied quality during a final blast of high heat. We ate with abandon, as if we were desperate to ensure our fair share of the meat. 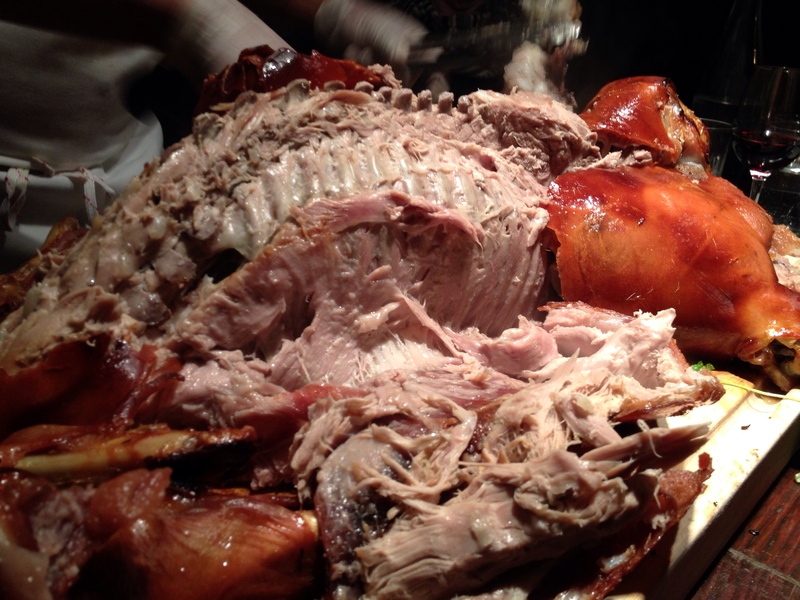 Within 15 minutes, everyone was easing into a pork coma. Turns out eight people are no match for even a modest 35-pound pig. The wait staff left us to contemplate a sparkling Moscato and a surprisingly refreshing maple panna cotta while they divvied up the leftovers. And so, less than two house after arriving in Dobbs Ferry, we found ourselves slip-sliding our way back down the hill, aluminum pans of meat and bones in hand. It is a good thing there are no wild dogs on Metro North. I made it back to Brooklyn around 11:00pm. It had been a long and booze-laden weekend. It was all I could do to shove the meat into the refrigerator and the pork bones into a baggie in the freezer before climbing into bed. A few days later, I found myself working from home in a desperate bid to push a couple of grants proposals out by the end of the week. It was a cold and nasty day–at least from what I could glean from my view of the alley and various social media posts. 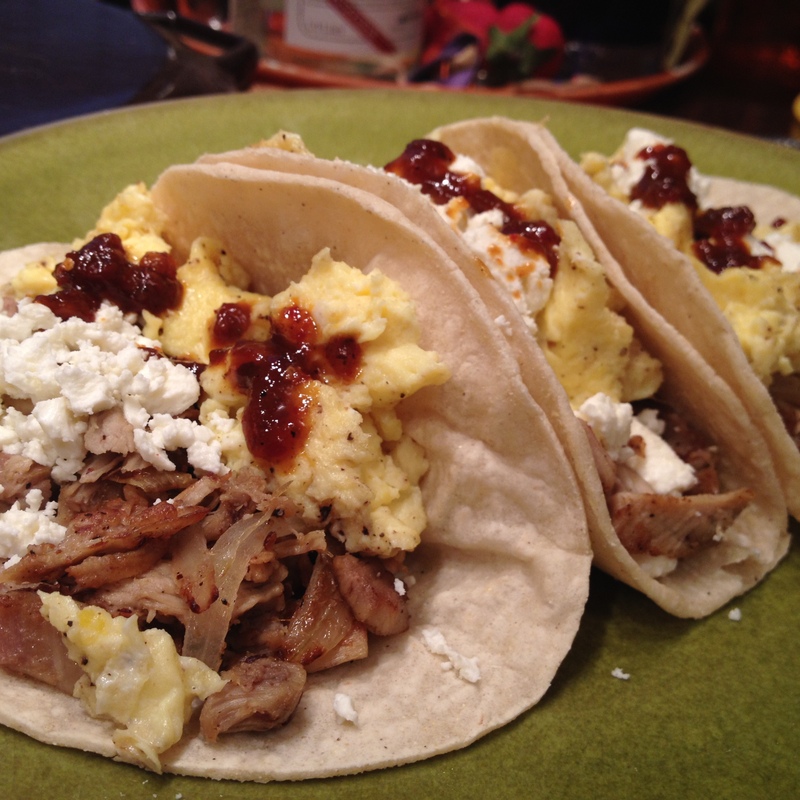 For breakfast, I fried up some of my pig meat with a small onion and added some scrambled eggs for quick and delicious breakfast tacos. But my real focus was the bones lurking in my freezer. 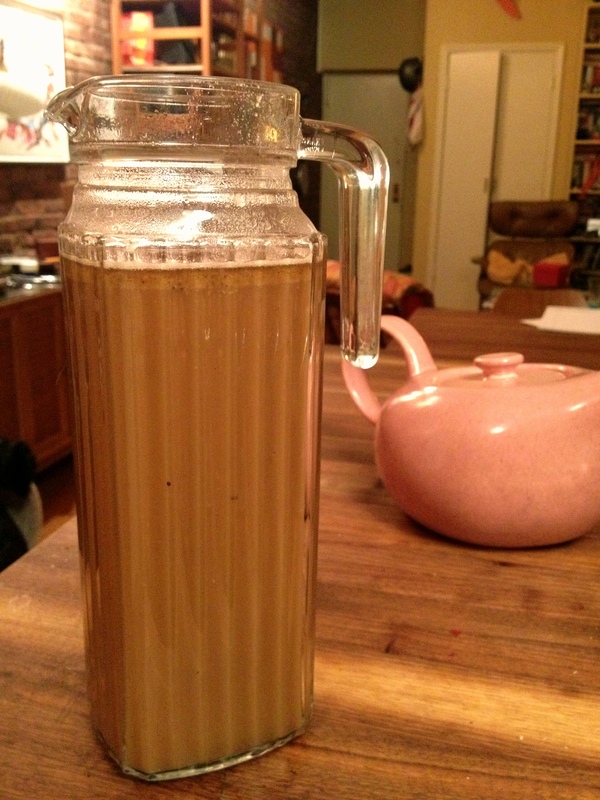 With a whole day at home, I had time to make some serious bone broth. I threw the bones into a roasting pan and popped it into a 350-degree oven. An hour later, I added a couple of quartered onions plus some roughly chopped and slightly limp root vegetables I found hiding out in the back of the crisper. After another hour, my bones and vegetables had taken on a rich brown color and were ready for the stockpot. I added enough water to cover everything, brought the pot to a boil and then lowered the heat until I had a very slow simmer going. I also threw in a couple of bay leaves and 12 black peppercorns for good measure. My pork stock simmered for eight hours, requiring nothing but an occasional stir and a little more water when the liquid started to get low. Before bed, I strained the liquid into a glass container, let it cool and popped it into the fridge. My patience yielded about a quart of unctuous concentrated pork stock. It was the texture of Jell-O and topped by a nice layer of pork fat, which I reserved for a future use. Half of the stock went in the freezer (I’m thinking ramen) and the other half went into a pot of flageolet the next night. More on those later. 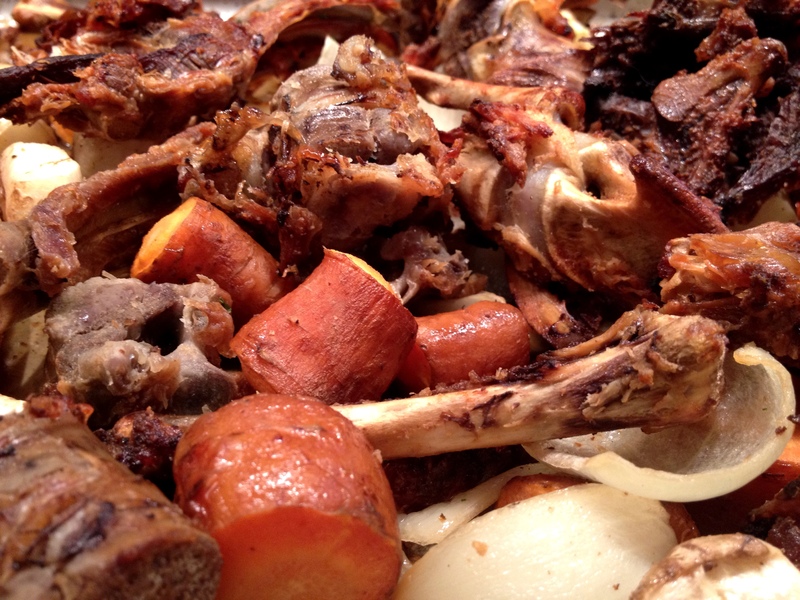 This entry was posted in meat, soups & stews and tagged pork, stock by Jasmine Nielsen. Bookmark the permalink.